Spring is here and I’m so excited to finalllly come out of hibernation and share some of my new favorite pieces!! I recently did a major Forever 21 shop and found two of my most favorite dresses that I know I’ll be wearing all summer whether it be for upcoming bridal showers, rehearsal dinners, or our 1 year anniversary trip…. !!! 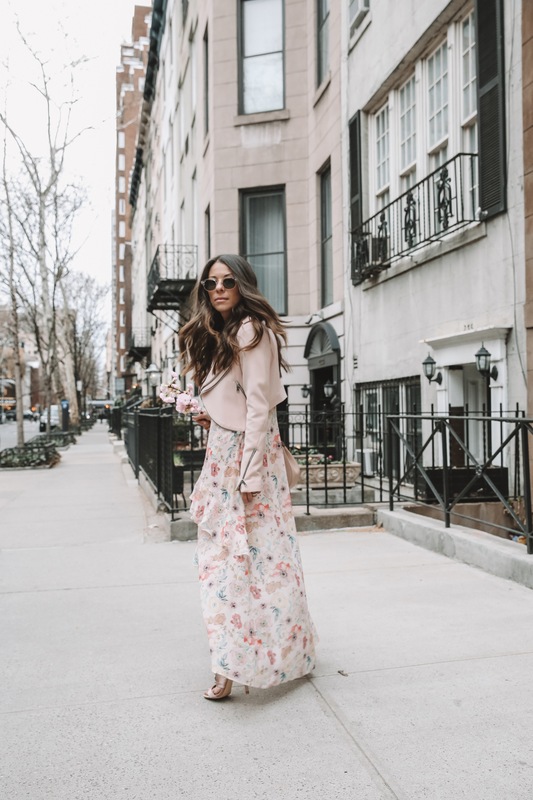 I styled this pink floral high low dress (which BTW, looks EXPENSIVE in person and I swear, no one would ever guess it was under $50 from Forever 21) with really old Zara heels and one of my favorite Zara moto jackets (that is unfortunately also from a few years ago so it is now sold out.) The one negative about sites like Forever 21, Zara, etc. are the pieces go SO FAST!!! I purchased this pink dress and it is now no where to be found on the site. I linked a few other similar options I love here, here and here. « Snowy City + Life Updates!